Everyone knows I love reading and all books. The only exceptions are textbooks, dictionaries, and classic books, so when I was assigned to read a classic, I was reluctant. I had never read an interesting classic book. 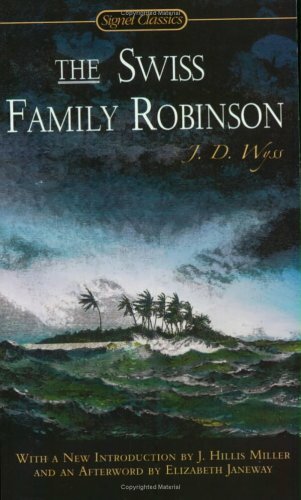 Then, I read The Swiss Family Robinson. The Swiss Family Robinson is about a Swiss family who find themselves stranded on a deserted island with limited provisions. The family consists of spirited Fritz, the eldest son; intelligent, studious Ernest, the second eldest son; bold, thoughtless Jack, the third eldest son; na've, little Franz, the youngest son; their brave, caring mother; and the main character and narrator, their smart loving father. This family survives in the wild and strives to make this beautiful but dangerous paradise, which they later name New Switzerland, into a comfortable home. The characters in The Swiss Family Robinson are interesting, funny, and well put together, by the end of the book I feel like I have known each of them all my life. I also love all the exotic animals Wyss includes in the book. From Ernest, 'the professor', to Master Knips, the monkey, the characters in The Swiss Family Robinson are the best! The Swiss Family Robinson is a great adventure classic! I recommend it for boys because all the main characters are boys except for the mother but, if you are a girl and like survival adventure books, go ahead and read it! This book is a perfect combination of adventure and humor, but also adds moments of fear, sorrow, and surprise. When you start this book, say goodbye to civilization and hello to The Swiss Family Robinson! good piece! I read this book and think you described it well! This is sooooooo good! I knew you were an amazing reader but an amazing writer too! see ya in da summa! this is an amazingly written piece. I love it.